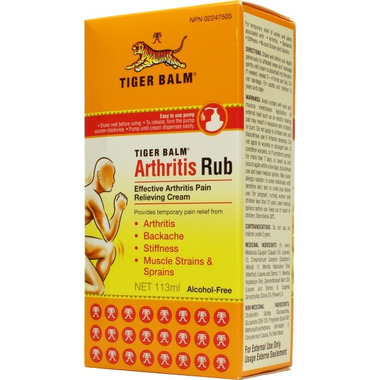 Tiger Balm Arthritis Rub, when applied topically provides temporary relief from joint pain associated with arthritis. It contains no alcohol, thus avoiding localized, dry skin conditions when applied. This is a highly effective cream in an easy to use pump bottle. This provides temporary relief from arthritis, backaches, stiffness, muscles strains, and muscle sprains. It is fast acting, soothing, greaseless, and easy to apply. This product works where it hurts! Best arthritic product. I use it night on my knee. It works!! I like this product a lot and it is not available in many places. It helps my arthritic knee pain, it doesn't take the pain completely away, but it helps. The smell is strong, but I love it. Cannot be without this product. It works for me! Wish it came in larger size. It is an effective topical pain reliever, but I find the smell unbearably strong. New to me ,this product has proven itself worthy of purchasing a second bottle. Its works really well on old and new pain. Has a strong smell but it is very pleasant . I have had chronic low back pain for over 30 years. This is the only non prescription product that has provided me with any relief. Each application lasts between 3 and 4 hours so you need to apply the product at least 3 to 4 times daily to feel any lasting relief. I have found that each 4 oz. bottle lasts about 3 to 4 weeks depending on how often it is used. This is the best product I've found for pain, especially arthritis pain. I'm in the process of trying every pain cream, gel and lotion well.ca has because I have such excrutiating pain in my knees. The right one doesn't hardly bend at all. This Tiger Balm Arthritis Rub really works, even when I found the Tiger Balm in the little jar did not work. I love the scent, it is a bit strong, but I like it. I apply the Arthritis Rub many times during the day, it does not drip and has a lovely smooth feel. Seems to make my leg look tanned, I've mentioned before that it had a slight browning or yellowing effect on the palm of my hand. Is in a handy plastic bottle with a nice pump. As a follow-up to my other review (in name of Kathy), this is an excellent product. I have noticed that it can tend to make the palm of your hand yellowish, even after washing your hands. So if you see your skin yellow, don't panic. I love the smell and the thicker creamy texture which makes it stay on my leg, and not drip down or drip on the floor. I forgot to mention in my review that this product is greaseless and does not leave your skin sticky. It has a wonderful smooth texture and actually seems to have made the skin on my leg softer. I could barely walk due to arthritis and pain in my knee, and I've bought and tried about 20 different liniments, creams, gels, oils, etc. This is the only one that gave me relief from the pain and helps my knee to bend. It is a pump bottle and the product is a medium-weight cream, thick enough to stay on your skin and not run off onto the floor, and thin enough to be massaged in easily. I love the scent, some people might find it too strong, but to me it is pleasant. It is suggested that you wash your hand(s) after applying but if I forget to do so, I've found that if I touch my face by accident, there is no stinging or burning that you get with capsaicin. I wish the Tiger Balm Arthritis Rub was in a bigger bottle, it is so good. Of course is preferable to the "GREASY" cream of Tiger with the same components (as a convinience and comfort), but those greasy can be used daily and everywherewithout any irritation problems. For example, is the Tiger Essential Balm of Quing LiangYou (19 gr, red metalic box, brown color, many ingredients blended in soft and hard paraffin) which is "greasy" but very efficient ! My suggestion to you: offer to customers all the "pallete" of Tiger crems and let us the customers to choose, combine and use together or separately the products at our convinience and needs! Recently purchased arthritis rub to help with my Mother's back pain. It has definitely made a significant improvement in my neck pain, so she should have similar results. I use this product everyday to relieve arthritic pain in my neck and it works very well. I have recommended this product to family members as well. used sporatically it is not as effective as when it is used regularly even when you think there some relief use anyway. I swear by it. Introduced to this product by my massage therapist and I love it. Recommended it to my mom and she finds it very effective as well. Tiger Balm lotion is an excellent product. It is easy to apply, blends in well and WORKS QUICKLY ON PAIN!!! It gets top marks in our book. 5 plus stars. Bought this item for my wife. She likes the regular Tiger Balm and unfortunately prefers it over this product. Even though she suffers from backpain due to arthritis, she stated that the original Tiger Balm helps her more then this product. Tiger balm is an old friend and always works as expected. A little bit goes a long way, is a proven pain reliever. Excellent product and Well.ca ar a great company to deal with. Will definitely purchase again and will tell all my friends about this product and this company and how efficent they are.